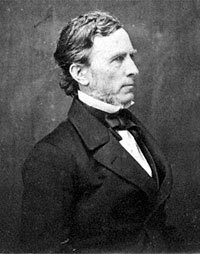 Maine Senator (1855-64, 1865-69, Republican) William Pitt Fessenden was chairman of Senate Finance Committee, which had responsibility for raising funds for the Civil War. He held that position before he succeeded Salmon Chase as Secretary of the Treasury on July 1,1864 and returned to it eight months later. 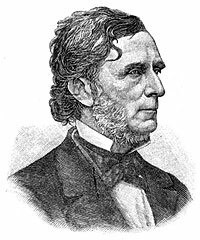 As a leading Senator in December 1862, he helped instigate actions which brought relations among President Lincoln and Radical Republicans in the Senate and Cabinet to a head and almost led to the ouster of William H. Seward from the cabinet. I delivered the message to the Senate & it was instantly confirmed, the executive session not lasting more than a minute: returned to my office. There I meet Abe Wakeman in high glee. He thought it a great thing to do: that henceforward the fifty thousand treasury agents would be friends of the President instead of enemies. I could not help pouring some cold water on his enthusiasm. After much anxious, not to say painful, reflection, I feel compelled to decline the appointment of Secretary, conferred upon me yesterday. Thoroughly exhausted by the labors of the session, and convinced by past experience, as well as by medical opinion, that I have reached a point where my physical powers, already much impaired, can only be restored and sustained by a period of absolute repose, I feel that to undertake, at this time, the duties and responsibilities of an office involving labor and interests so vast, would be an act of folly on my part, and certain to result in speedy failure. 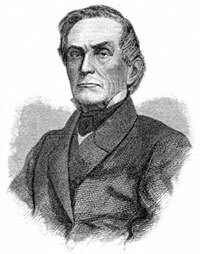 Upon his return to Congress, Fessenden became chairman of Joint Committee on Reconstruction. He was one of a handful of Republicans who voted against removal of President Andrew Johnson, thus earning him the enmity of Radical Republicans with whom he had once been identified. Fessenden was an attorney active at the local and national levels. He was the father of two Union generals, Francis and James D. Fessenden; another son died in Second battle of Bull Run. His family was remarkable in other ways. 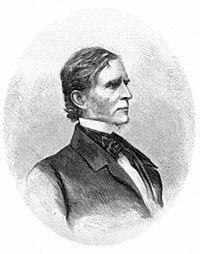 Two of Fessenden’s brothers served Maine in the U.S. House of Representatives at the beginning of the Civil War. Two other brothers served in federal patronage positions, which Fessenden was skilled in filling with friends and relatives. 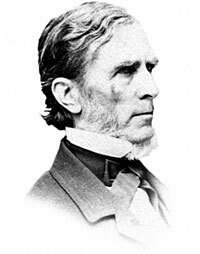 Prior to the Civil War, Fessenden worked as an attorney and served in the Maine House of Representatives (1832, 1840, 1845-46, 1853-54) and in Congress (Whig, 1841-1843). Benjamin P. Thomas and Harold Hyman, Stanton: The Life and Times of Lincoln’s Secretary of War, pp. 313-315. Francis Carpenter, Six Months in the White House, p. 183. Michael Burlingame and John R. Turner Ettlinger, editors, Inside Lincoln’s White House: The complete Civil War Diary of John Hay, pp. 215-216. Francis Fessenden, Life and Public Services of William Pitt Fessenden, pp. 320-321. Fessenden, Life and Public Services of William Pitt Fessenden, p. 319 (Letter from William P. Fessenden to Abraham Lincoln, July 2, 1864). Gideon Welles, Diary of Gideon Welles, Volume II, p. 238. Charles A. Jellison, Fessenden of Maine, p. 131. Jellison, Fessenden of Maine, p. 169. Maunsell B. Field, Personal Recollections: Memories of Many Men and Some Women, p. 307. Jellison, Fessenden of Maine, pp. 190-191. Hugh McCulloch, Men and Measures of Half a Century, p. 190. Michael Burlingame,Abraham Lincoln: A Life., Volume II, p. 72.